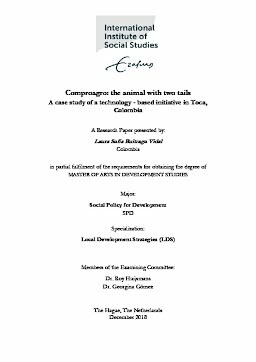 This paper explores the transformations and continuities of the development landscape through the story of Comproagro, a local initiative created by a rural family in Colombia. By using an ethnographic approach, I learnt about the different realities of this technology -based initiative, and how each one of them speak of new ways of doing development. I found that, in the digital space at the national level, Comproagro is best known for its online plat-form. However, the app reality challenges the notion of ICT4D as a key vector of local development because in ground bases, access and use of information technology is a luxury that only a few can afford. In the material space of Comproagro, the initiative is better known as a social enterprise which promotes women’s employment and fair working conditions for local women in Toca. The app and the social enterprise represent dramatically different mo-dalities of development and constitute the two tails of Comproagro. Finally, I conclude that small initiatives like the one driven by the family in Comproagro challenges the idea of a broken development, to claim that instead it has changed through new actors, sites and relations that shape what I called, the new modalities of development.